Enjoy Kumbha Mela at Haridwar and explore historical destinations of Agra and Jaipur through our Haridwar Agra Jaipur tour package. After your arrival at the Delhi airport, you will be met by our representatives and escorted to the hotel. Overnight stay will be at the hotel only. In the morning, you will be introduced to the yoga instructor and also go through a short session. Thereafter, you will have your breakfast and leave for a sightseeing tour of the city. You will be visiting Birla Temple, India Gate, Parliament Area, Government Buildings, Humayun's Tomb, Qutab Minar, Gandhi Memorial and Jama Masjid. Overnight stay will be at the hotel only. On the third day of your tour, you will be leaving Delhi and proceeding towards Haridwar. On reaching there, you will check into a hotel and freshen up. Thereafter, you will leave on a sightseeing tour of the city and visit the various ashrams as well. Overnight stay will be at the hotel only. 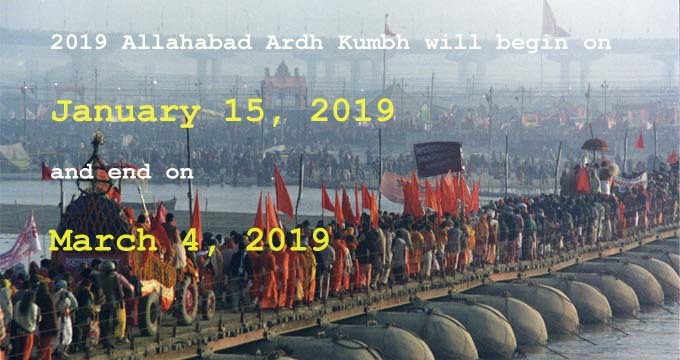 The next three days of your tour will be spent in exploring the Kumbh Mela activities, including prayer ceremonies, bathing rituals, etc. Overnight stay will be at the hotel only. On this day, you will have breakfast at the ashram and then move towards Agra, via Delhi. On reaching there, you will check into a hotel and retire for the night. You will get up early in the morning and explore one of the Seven Wonders of the World - Taj Mahal, followed by a trip to the Agra Fort. Following this, you will leave for Jaipur, visiting Fateh Pur Sikri enroute. On reaching there, you will check into a hotel and retire for the night. After having breakfast, you will leave for Amber Fort and enjoy an elephant ride there. Thereafter, you will have a quick tour of City Palace and Observatory. In the late afternoon, you will drive back to Delhi airport and catch the flight to your destination.